Thirty percent of contact lists and databases are outdated after 3-6 months. When did you last validate your lists? Marketing and Sales databases are often filled with incorrect and out-of-date information for the sake of volume. Companies know how inefficient and cost-ineffective it is to utilize outdated info, let alone to dedicate the time of an experienced sales person to updating an inaccurate database. It has been our experience that databases lose their accuracy at the rate of 30% per quarter. People move, relocate, or change jobs and it is difficult for companies to timely track this movement. If you use a poor-quality list for marketing and sales, you could unintentionally be starting out with a high miss rate right out of the gate. Moreover, if you send emails to incorrect addresses, you could alert spam filters and potentially be blacklisted. This is why a clean database is so important and why cleansing needs to be an ongoing process. Using our List Validation Services can be a preventative approach to save your business both time and money. 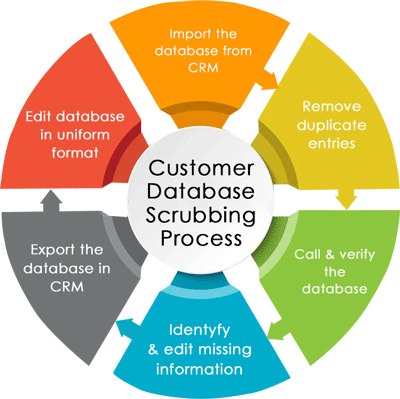 Also known as database scrubbing, database validation is the process of identifying and removing incorrect entries in a database. We make sure your database does not have inaccurate, incomplete, incorrectly formatted, or duplicate data entries. What differentiates aMarketForce from other list developers is that our secondary research is supplemented by calling each contact directly to verify the accuracy of our generated data. aMarketForce’s customer Database Validation Service will scrub existing databases, replace incorrect contacts, update contact information, validate targets, and ensure a relevant and verified sales asset. A recent study by Sirius Decisions says anywhere between 10-25% of your prospect data contains errors. This ultimately leads to delay in sales engagements and stall opportunities. Another research by Biznology reveals that B2B data decays at a rate of up to 70% per year. aMarketForce can streamline your CRM database by eliminating incomplete & inaccurate data through cleansing and updating missing/incorrect information at regular intervals. aMarketForce’s skilled personnel handles the laborious tasks of validating, scrubbing, cleansing, and updating our clients’ databases by researching relevant target companies and verifying their contact information by phone. We also help clients by importing and exporting customer/prospect databases in CRM. aMarketForce can be a valuable partner for keeping your marketing and sales databases updated and current. In addition to Database Validation Services, aMarketForce also provides Prospect Database Development and B2B Lead Generation. Contact us to learn more about our B2B Inside Sales Services and the other ways we can support your sales and marketing teams. Request a Quote for B2B Inside Sales and Integrated Marketing Services.